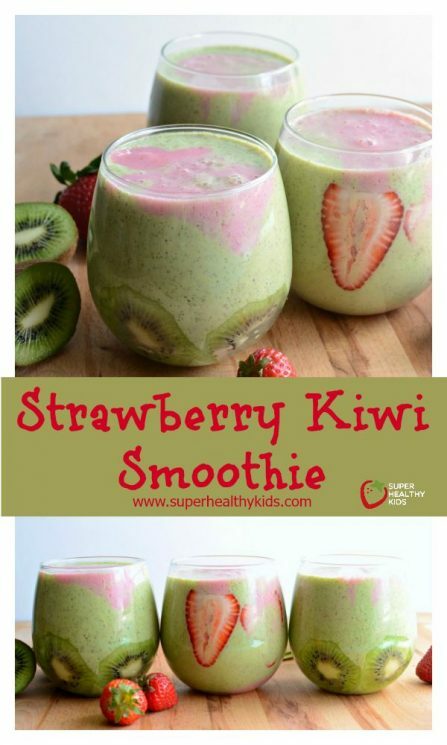 Hello Super Healthy Kids fans! 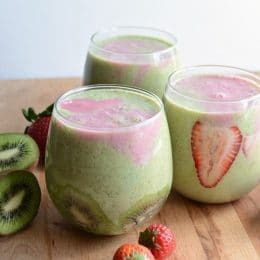 You are going to love today’s Strawberry Kiwi Smoothie recipe because it’s naturally sweet, easy to tweak to accommodate dietary needs, and it takes a full 5 minutes (if that!) to toss together. It makes an awesome snack and can even be served for breakfast; make a double batch and freeze half of it for popsicles later. 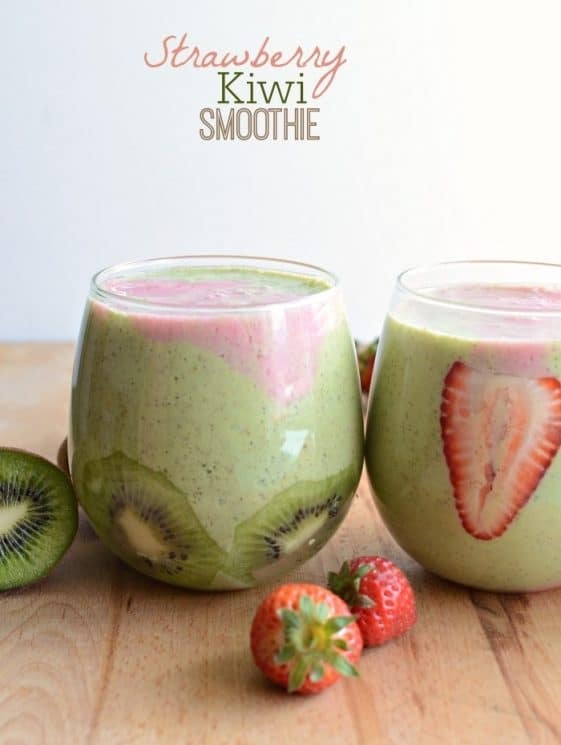 You can’t go wrong with that perfect strawberry and kiwi combo. My name is Melissa and I blog over at Bless this Mess. My blog is a happy glimpse of small town life; I share lots of recipes, gardening tips, and our adventures in beginning a hobby farm (like hatching our own chicks!) and building our house. 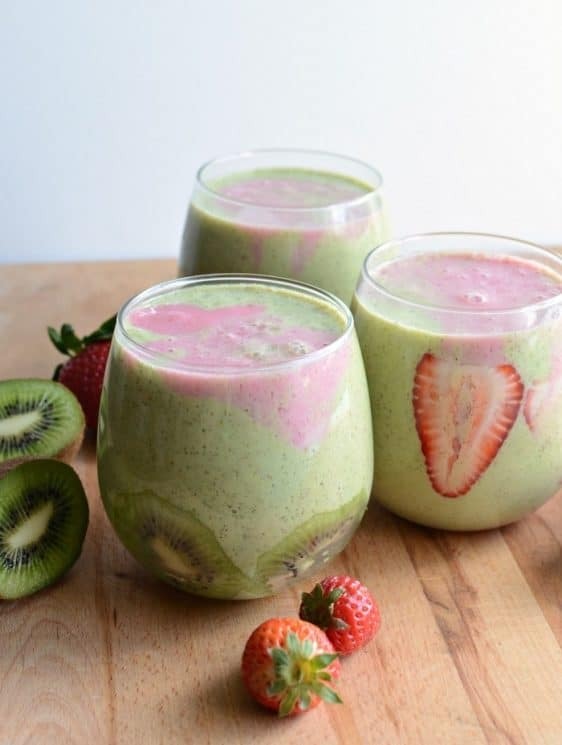 Smoothies are one of my favorites, you can see all of my smoothie recipes here. Enjoy! Strawberries are starting to come on in the United States and are one of the first fruits of spring. These bright sweet little gems are packed with vitamin C and fiber and help reduce inflammation. I like to get organic strawberries when I’m buying them from the store, but my favorite way to get them is to hit up a you-pick farm! This is such a fun way for kids to see where their food comes from. If you have a bit of space, consider planting strawberries in your flower beds. They are lovely little plants and with a little research and preparation, I bet you could grow your own. I just planted 60 plants this weekend and hope to get pounds and pounds of berries one year from now. I’ll let you know how it goes. Kiwi fruit has a lot in common with the strawberry; I think that’s why they are such a natural pair. It too is very high in vitamin C and dietary fiber. Kiwi is native to China but is now grown even in California. Here’a a quick furry skin removal tip- slice a small bit from each end of the kiwi and then slice it down the middle (not end to end, cut through the roundest part). Use a spoon to remove the fruit from the skin and you’re done. Did you know that the kiwifruit was named after its uncanny resemblance to the “fuzzy brown kiwi” – New Zealand’s National Bird. 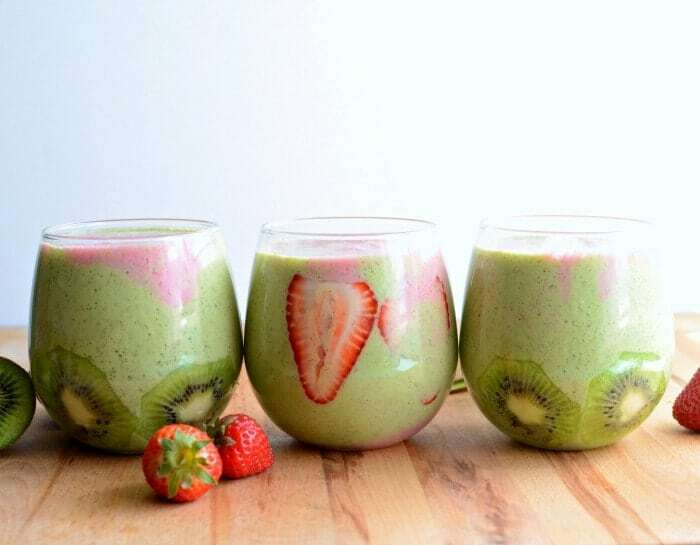 Now that you know a little more about what’s in the smoothie, let’s get blending! Aren’t they pretty?! They taste even better than they look! Thank you for having me! Instagram is my all time favorite social media. Stop in and let me share my adventures in mothering 4 (soon to be 5!) kids, cooking, and farming with you. Enjoy! i love all these “drinks” healthy is possible!! Hmm this looks so refreshing, will have to give this a go. Thanks for sharing.